Stock # X73427, Automatic, 137466 mi. 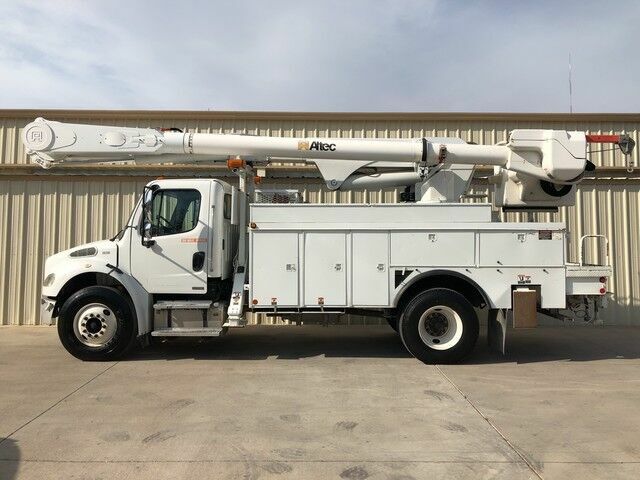 This 2007 Freightliner M2 Business Class Bucket Truck is in excellent shape. This truck has a 7.2 CAT C7 Engine mated with a Automatic Transmission. This is a 1-Owner truck that has an Altec AM55 Bucket Truck Conversion with Material Handler. This is an Insolated Articulating Overcenter Bucket truck. This truck has a working height of 55FT with a side reach of 47.7FT coupled with a continuous base rotation and a Insulated Boom. The capacity of the Bucket is 700lbs and the material handler has 2000lb capacity. This truck has been always serviced and there are over 52 service records reported on to Carfax. This truck definitely will not disappoint and has low miles for a 2007 model truck. This truck was freshly inspected by diversified Inspections and its ready to work for you! Please Call us with any questions. We can assist you with reliable shipping to your home or complementary Airport Pick Up at DFW International Airport or Dallas Love Field! Please call us with any questions. Trey @ 972-637-4234, Richard @ 972-935-5788, William @ 214-674-9221, Para Espaol contactar Blanca @ 972-351-2840.